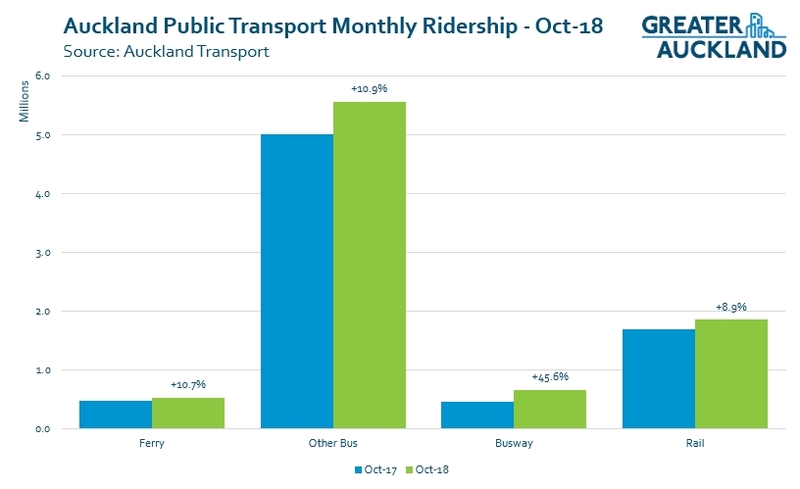 A few days after I published my post on ridership for September, Auckland Transport released the data for October. 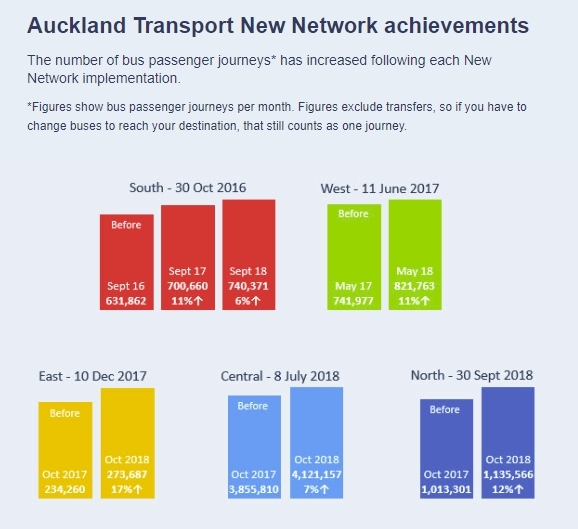 The month is significant as it’s the first one since the new bus network on the North Shore was rolled out, completing the major changes that have been in progress for the last few years. 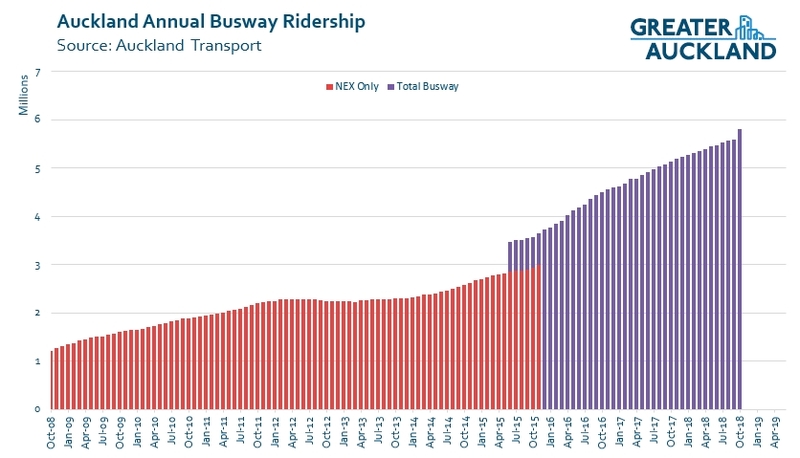 The busway experienced significant growth, most likely thanks to the increased frequencies on the NX1 (formerly the NEX) and the introduction of the NX2. 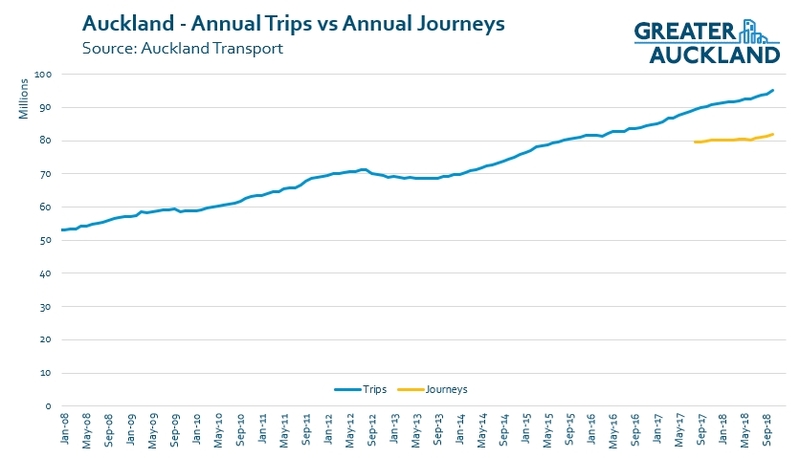 Total busway trips jumped a staggering 45.6%. The increase was so significant it even stands out on the annual rolling graph. If this continues, we could see the busway become busier than some of our key rail lines within the next few months, a great example of the power of speed and frequency to drive usage. Frequent buses also saw strong growth with trips up 65.1% but some of that will be related some routes across all the areas rolled out in the last year now being classified as frequent. Trains saw some improved growth after what has been a sluggish year. The growth was enough for the annual rolling number to pass 20.5 million, finally passing the previous ‘high score’ of just over 20.4m achieved in November last year. The good news is more trains are in the process of being built. Even the ferries got in on the action with almost 11% growth for the month and both the contracted and exempt (commercial) routes seeing an increase of 10% or higher. In a newsletter a few days ago, AT also included these charts showing how usage was changing in each of the regions of Auckland following implementation. As you can see, all areas so far are experiencing growth. The Journey selection shows how many apportioned Journeys each category received. For example: 1 Journey has two trips, the first trip is Bus Mode for 2 stages and the second trip Train Mode for 1 stage. Then the Journey will be 2/3 Bus and 1/3 Train. If a second Journey had 2 trips, the first trip is Bus Mode for 1 stage and the second trip is Train mode for 3 stages. Then the Journey will be 1/4 Bus and 3/4 Train. Adding these two Journeys together you would end up with 2/3 + 1/4 = 11/12 = 0.92 Bus and 1/3 + 3/4 = 13/12 = 1 1/12 = 1.08 Train. This means the weighting for each Journey is identical regardless of the amount of Revenue received. I was also interested to see how that journey data changed over time, especially in relation to the new bus network. Again AT kindly provided me with the data to allow me to fill in some of the blanks. Unfortunately the data only goes back to just over a year to when integrated fares first rolled out. One of the first things you can see in the graph is how we’re already seeing trips the results for trips and journeys diverge. It will be fascinating to see how this changes in the coming years. The numbers suggest we have about 1.2 boardings for every journey. For a quick comparison I looked at Vancouver which publishes both numbers. They have about 427 million trips and 257 million journeys. That’s 1.7 trips per journey so we’ve potentially got a lot of room to expand the network. 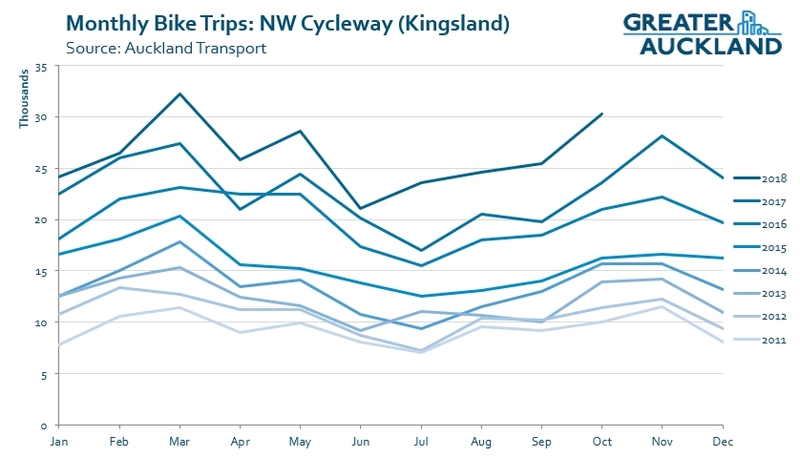 Finally, we also saw decent numbers on many of our cycleways in October with many of the counters seeing double digit increases over October last year. For all counters where we had data last October, there has been an 18.3% increase. 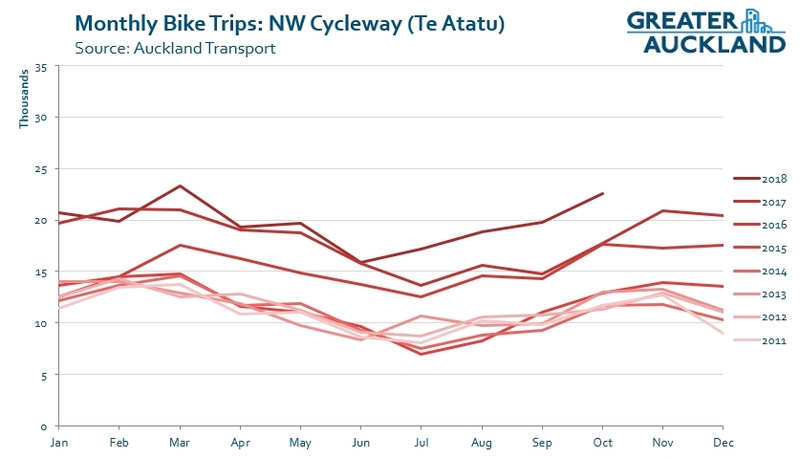 The NW cycleway has been one of the most consistent in seeing growth this year. Here are the numbers for it at Kingsland and Te Atatu. Of note, the lowest month in 2018 in both of these is about the same as the peak of 2016. These two are significant as this morning will see the formal opening of the Ian McKinnon Dr extension of the route, cutting out the sharp climb up to Newton Rd. Those busway numbers are bonkers, must be everyone who was taking express routes swapping over and others taking advantage of the vastly improved frequencies. In October the busway actually had higher patronage than *every* rail line, not just some of them. As you said, this is proof that all day frequency is king and AT/Kiwirail really need to pull finger on 10 minute all day train frequencies. It’s also proof that we should make sure all rapid transit extensions can achieve high frequencies. “Busway” measures the new NX1 and NX2 services, formerly the NEX and 881 before the new network, but not the direct peak expresses or other routes that used the busway. So you are right, what we can see in the data is the network restructure. Previously people caught busway and not-counted-as-busway routes. Now they can only catch busway routes. Naturally a large chunk of users have shifted to what counts as a busway route. Not quite true. It counted anything that boarded at a busway station that was heading up/down the busway regardless of what service they got on. Well, here’s an example. To get to Wairau Road, I used to go to Takapuna and take the 891. Now, I go to Akoranga and because there’s no direct bus from there, I have to take any northbound busway bus to Smales Farm and take a 901. So I’m doing a single leg run between stops on the busway now, and where it was previously two boardings, it’s now three with a huge off-route circuit through Akoranga. The only bus – the only – doing the full length of Wairau is the 901. I so agree with this. And do not understand the official line that we don’t have enough trains for 10 min freq all day. As we do for 10min frequencies at the peaks so why not off peak too? Especially as they could be 3-car sets with higher frequency off peak. And there’s been plenty of time to train drivers…. Are freighters using all the slots? Or is it just the constraint of the farebox recovery target? Kiwirail will only allow the peak frequencies that we currently have between Westfield and Wiri for the peak windows each day. There are too many freight movements during the rest of the day. It’s why the afternoon peak period is longer on the Western line than it is on the Southern and Eastern lines. This would all be solved by the third main. Which is apparently being held up by NZTA’s laborious and repetitive biz case process. Wants reforming. So no real reason can’t be 10 mins all day on the Western then. No reason at all. My guess is that they don’t want to increase frequency on the Western line only to have to reduce it again during CRL works at Mt Eden when there is only going to be single track for a period of time. Just as an aside, do the new EMUs contain any improvements on the older ones (faster door ramps??) to help with dwell times? or was it simply a case of “Rinse and repeat” once it was decided to go against batteries…. That isn’t what the article linked to says. I assume that when we placed the order we had the option, and at some stage we had to declare if we were taking up that option. Since then we have been told that there are only minor differences. And there’s been plenty of time to train drivers…. Training them is only one constraint. Are they being paid enough to retain and grow numbers? Thanks for the great posts. Previously on this blog when ridership data was reported you included line graphs on farebox recovery and PT subsidy per passenger kilometer (see the two line graphs graphs here https://www.greaterauckland.org.nz/2018/04/17/maddest-march-yet/ ). We haven’t had any such graphs in recent months. It would be greatly appreciated if they return or you or someone give me the data for October 2018 (or september if these figures are not avaliable yet). Thanks again for the great posts and all the information. The data comes from the monthly indicators report (near the end). There hasn’t been a lot of change recently. “Have these numbers exceeded the projections for 2026? Why not! If we are not exceeding the 2026 projections in 2018, it just goes to show that no one catches buses, trains or rides bikes!” – Mike Hoskings rambling rant on breakfast tomorrow. The increase in cycling numbers is really clear. October included the school holidays. Did anyone else notice that these holidays, the morning peak didn’t seem to get the school holiday relief you’d expect? Is there anywhere traffic numbers are recorded constantly so that changes from week to week are visible? Just wondering about comparing PT ridership with congestion levels. Can you give numbers for the yellow journey line, Matt? There used to be monthly state highway numbers but the NZTA stopped them. Now only the annual ones remain and AT have data on doors where they do counts but those can be years in between. Yeah, that’s all I’d found. Thanks. Seems to me there should be a number of main arterials and collectors that they monitor constantly, to give the overall pattern. In fact, how would you be intelligently planning and evaluating integrated networks and corridors without this information? This sounds like a no brainer. It would be a good way to sell public transport as well as cycle lanes too. The northern busway and to some extent rail is irrefutable evidence that fast (assisted by frequent) equals an attractive product that results in high and growing patronage. That the busway is incomplete north bound between Fanshawe St and the bridge and from there to Esmonde Rd is a concern which surely NZTA can address. In any case it is no coincidence that both forms run on their own roads. On the other hand, slow as in every other bus service remains not very desirable in dragging people away from their cars and gives slight growth. The huge “what if”, were it fast and not hampered by using general vehicle lanes and stops every 200 metres, how much better off would we be? Bus stops are not every 200 metres. Agree, this is the big improvement we can make in the next few years, as we wait for the next big improvements to the rapid transit network. Remove redundant stops where possible, but the priority absolutely should be giving buses their own ROW and signal priority. Increasing stop spacing provides some travel time benefits, but at a cost of access, whereas ROW & priority is all upside with much greater potential travel time benefits, not even including the likely disbenefits to private vehicle. The priority also has to come first because people are willing to walk extra distance for a fast, frequent and reliable PT service, but not as much for a bus that uselessly sits in traffic queues. I think that there are many variables leading to the bus ways success. In no particular order some of these are: in the growth areas on the Shore many of these people will work in the city; Shore residents are better placed to pay higher fares than other parts of Auckland; there is likely to be a greater appreciation of climate change and therefore use of PT. While the bus way does have frequency, often it doesn’t have reliability due to travelling in motorway traffic (will we ever be allowed to forget the bus driver who cut the queue – if we had a photo of every driver who used a bus lane there wouldn’t be space for any other news). I believe that price reduction is likely to be as much a driver of ridership growth as better frequency and so we should invest in both. The feebate scheme as proposed will deliver significant revenue that should be applied to public transport. I am more confident that is the right call after the comments by the MTA today. Agreed, price is very important and the blip in pump prices probably assisted the rise in patronage. Now at 2.06 per litre 91 at Gull in my neighbourhood so we will see if that has any effect. The traffic is appalling in the morning. From my perspective spending the least time in commuting is a priority and I assume that for most other people, so if there is a way of speeding up the buses, the people will use it. On a positive side the “journey” feature of HOP is brilliant. I took a bus from my place to Te Papapa return (back in the day that was 6 stages, now less owing to the new system) to buy something and it was incredibly efficient. Minimal wait times for the bus, not so good for the Onehunga service as it is only half hourly unfortunately but once in motion it only stopped 4 times from the city to my destination and it was value for money. I don’t think I could have driven for any less! And the southern motorway was crawling as per normal. So well done AT, really impressive. Maybe add a bit of track to allow more frequency for Onehunga to encourage growth! Oh that’s meant to be in reply to Waspman comment to busway above. My PC is out of action for a little while. Thanks for sharing that. It’s a good beginning and the way St Mary’s Bay is evening peak there’s no more room for a bus lane without seizing up the motorway. Anything to avoid road reallocation, eh? So if the shore busway gets more successful then it will likely never be replaced with Light Rail, at least to later this century. Will the same apply to the new A2B busway via Puhinui, LR there 50 to 100 years in future? If anything I’d say the opposite, the success is likely to bring forward the time that the busway reaches capacity. I’d say by the middle of the next decade there will be strong calls to get on with converting it to LR and building a tunnel or bridge, much like there was with the CRL. It will likely coincide with National returning to power too, so we might end up with the same situation again. Like Jezza, I think the opposite. The major problem is we’re already at the point that it’s going to be incredibly difficult to manage the upgrade as they need to not only lay tracks and wires but also move underground services. Basically the busway needs to be rebuilt. Of note, the busway extension to Albany has been designed so that services are already out of the way and so won’t need to be moved so that will make things easier. I think that the work for light rail needs to start now if it is to be ready when it is needed, which should be in advance of when AT thinks it is needed. I am in favour of a bridge congestion payment to pay for it as happened with the original bridge. Such a payment would also give breathing space on the roads until the new crossing is finished. Surely there is a need to consider the effects during construction of light rail? We wouldn’t want to be in the situation of having to decide to put light rail next to the busway just because the political situation means we couldn’t disrupt the busway? Delaying until passenger numbers are so high that a suboptimal design is necessary just to avoid disruption seems like, well, insanity, or, perhaps, delaying tactics. Heidi, is the most logical thing when the bus way is extended beyond Constellation to lay light rail at the same time? I had always thought that instead of this bus way extension it would be better to make this the start of building light rail, but I guess we have gone beyond that. I have written an opinion piece about funding Shore light rail by tolling the Harbour Bridge. At a toll equivalent in modern days terms to the original one way toll such a project would be achievable. Does that mean busses and hence passengers would also be tolled? Making NS NEX and other bridge routed bus pax pay for future NS LR. The bridge was never designed to carry any kind of rail, and it is practically impossible for to do so now. Wasn’t there a report to ARA about the clip ons with light rail lines? If heavy traffic was limited to the original bridge centre lanes. Why impossible now as clipons have been strengthened so LR could be done. Bogle, have you ever stood on the clipons? As part of a former occupation I was required to walk back and forth underneath the bridge. Did it regularly. The original bridge was rock solid but the clipons in the central arch moved up and down with respect to it constantly. About 10 cm at the top. You could stand there and watch as they did it on a full cycle of about 30 seconds. I think light rail *IS* the heavy traffic in this case and would prefer to see it on the original spans. Nick R I think you are right about the Harbour Bridge not being designed for rail. Even the thought of putting Sky Path on the bridge is scary. What about a toll on the Harbour Bridge to pay for an under-harbour tunnel which provides for rail? Bogle, politically courageous perhaps, but the future pricing of roads is likely to be absolutely necessary for Auckland to meet its climate change objectives.The government is already considering measures such as the Productivitiy Commissions’ feebate, ill conceived and even less effective in my view, to discourage fossil fuel car purchase. Change is inevitable. Would North Shore people be prepared to pay a toll that would guarantee them at least a congestion free bridge and feeders, and also a fast efficient light rail? Sixty odd years ago Shore residents were prepared to pay, and significantly ($6 in today’s money) for a facility that has served them well. When you look at the endless lines of traffic on the Northern motorway currently people may not like to pay, but they might see that it is necessary. Say the toll was $6. Do I drive from Albany and pay this, or take the bus and pay 2 x $4.80. Suddenly the pendulum is swinging starting to make public transport way more attractive? As an aside we are looking to travel to Italy next year. It will cost us about 55 euros in tolls to drive from Milan to Naples (754 kms). For the two of us we can travel by high speed train from 80 euros. There are 26 different trains between 6am and 10am on the day we looked at travelling. Yes I know that Italy has 60 million people, but it is illustrative that with different pricing mechanisms very different outcomes can be achieved. I wonder why the government funded report on cheaper train transport was simply buried by the last government? Good points. However, isn’t the NEX and other over bridge busses already near capacity? Road pricing, harbour bridge tolling may well achieve a mode shift by reducing mode alternate commuting costs, but is NS PT able to grow to absorb any significant increase in pax numbers? When I early morning commute the NEX are crowded. And I don’t see any plans to upgrade bandwidth significantly. So if the road pricing policy is to encourage shift away from ice sov then I think it will be minimum effectiveness. I reckon NS ppl will see it as just another tax being touted for uncommitted futurist major NS transport upgrades but like the local petrol tax will be frittered away on a host of minor and often pointless or dubious traffic management schemes (such as the millions to be spent on the raised tables and road paint at Glen Eden). If the purpose is to discourage ice vehicle use to combat the increasing Auckland air pollution then taxing users is a fuckwit solution. This is where govt should be leading the way and addressing the main road polluters. These are diesel ice vehicles. We hear that the most popular new vehicles are the SUV types yet 99% of these new vehicles are diesel. We need law changes ASAP to stop this madness. Set a near date, say 2025, to ban diesels from Greater Auckland. Follow the example of other overseas cities. Now. I understand SUV popularity here results from a non-critical adoption of the popularity in the US, where SUV’s are exempt from emissions standards. I agree with you. We need to make law changes, and I would add that we must not follow the US’s laws since they’ve obviously created the fashion in the first place. “is NS PT able to grow to absorb any significant increase in pax numbers?” It is, if lanes are reallocated to it. If there’s both additional PT ‘bandwidth’ – meaning better frequency and more routes – and fewer general traffic lanes available, people will presumably switch. But if the congestion means those who do need to drive are held up, there would surely be a case for a toll or a congestion charge. Also, since passengers are subsidising drivers through the public health and environmental costs imposed by driving, it is equitable to get those drivers to pay more towards those costs. I agree, though, the capacity of the PT system must be increased. Bogle, while current buses may be full I am sure there is capacity to add buses to the busway. Matt L says that the constraint point is likely to be city bus stops and it doesn’t seem that we have reached that point yet. I agree with you that a toll couldn’t be general in nature. Those of us who are older will remember the Auckland Harbour Bridge Authority that was solely tasked to administer the bridge. There seems no reason why something similar could not happen again. Every day I read on the net about climate change issues. How long are we going to stumble along just as we are? Are we going to say, it’s only Petone so it can go under water? or Mission Bay? or Little Shoal Bay, or Takapuna beachfront property on the Shore? Not sure if this is just me but has anyone noticed the trains running between Otahuhu and Puhinui going slow because there’s a train in front of them? Are you sure? Constellation is basically at capacity even with the recent changes. Albany and Sunnynook are at 80-90% and will be at capacity once the busway is extended to Albany. We should build the LRT using fuel tax. Fuel tax should increase at least 3c/litre annually and probably by closer to 10c per litre annually. Make it clear that it is a sin tax like tobacco excise. What’s the limiting factor at the bus stations, SB? Do buses stay in a station too long because there is a problem with the design of the ingress and egress? It’s a combination of things, the physical number of bus stops, the approach and departure space, the intersections on the approaches to each station, the number of buses scheduled, and the dwell time and passenger loadings. You can overload on one factor at the expense of others, for example double deckers increase the passenger loading of each bus and move more people in the same number of buses, but at the expense of longer dwell times as more people board the same bus. Longer dwell times means you can get fewer buses through the same number of stops in the same period time, so you end up with more bus congestion, all else being equal. That can cause tail backs to the intersections or block other buses approaching the station. Stops/stations are usually the first constraint, then intersections or junctions, manoeuvring space and layover/repositioning. The busway itself between sections is practically unlimited: it could take about five times as many buses as it does today. However in practice that is an irellevant fiction, the busway system is the sum of its parts and can only perform as well as its worst constraint. You can see what is required to keep adding more buses to a busway in Brisbane: Huge grade separated bus flyovers, bus only bridges, double underground bus stations, full grade separated running way. THey’ve spent something like six or eight billion dollars building their busway system and truth be told the thing still clogs up at the pinch points. So there would be little point in taxing or tolling harbour bridge users as a mechanism to promote shift to PT since existing PT is just about maxed out? Although it may promote traffic rerouting to western ring. As a simple revenue earner it would work, highly unpopular and a courageous political move. Sounds to me like some capacity can be added in by adding priority for buses at the surrounding intersections, and removing general traffic from the surrounding area as much as possible, which would also improve active mode access to the station. Also, have you seen any BC analysis of making public transport free, Nick, that includes the cost of the larger stations, due to the much longer dwell times that tagging on and off and paying cash cause? Sort of. Yes if you fix the surrounding intersections, and the stations, and the traffic you could get much more capacity… but see above re: Brisbane what that can actually involve. There is only so much you can get out of a given amount space before you need to shift to a more space efficient mode, or find more room. Its a bit like saying my little Corolla hatchback could go 300km/h… if you just fixed the engine, the running gear, the fuel system and the body shell accordingly. At some point it’s easier to get something purpose built for higher performance. My conclusion, not a good idea. As for the dwell times on the busway, tagging on and off has little impact, now that cash payment is almost never used. It’s more the flow of passengers on and off through the doors and the relatively narrow aisles, and on the double deckers, the issues around the stairs. The single file, steep stairs really limits the passenger flow within the vehicle. I wonder if AT ever does drone coverage of the bus stations at peak hour, to see the overall pattern of where the congestion is holding up the buses? So to improve passenger flow would upgrading the busses to higher capacity multi door types like bi articulated designs be the way to go. Although these would likely need stations redesigned. Or is light rail the only future? When? I had understood that Busway capacity was estimated to be reached around 2030. Sounds like we may already be there? Or at least at the stage where we need to agree on the mode shift and start planning for rail? Every day I board a bus at the last city stop heading north – Victoria Park. Anecdotally buses are not at capacity. I have never seen an NEX1 or 2 refuse to board passengers. And neither do I see huge queues suggesting people are left behind. There is capacity to move people out of cars; and if there isn’t then it is simply disgraceful on AT’s part that there isn’t, because their Statement of Intent provide that there should be. A bridge toll is of course just a congestion tax by another name, except that it provides other benefits than just reducing congestion. Sooner rather than later Aucklanders are going to be required to reduce emissions. The answer won’t be electric cars because there is not a plentiful cheap supply. And there is not enough electricity. I am enormously sceptical that the revenue will come from an Auckland petrol tax, although the annual revenue is about right. Certainly there will be enormous resentment from the rest of Auckland. A Shore funded light rail where the benefits reside in the Shore might get over the line. A huge number of Shore residents understand the need for carbon reduction and for many there is a real frustration that currently nothing is happening. As the Prime Minister says, there is the greatest issue of our generation, and we will have to accept that life will be different including greater costs for carbon unfriendly activities.